Leema Pulse III review | What Hi-Fi? This third generation of Pulse amplifier is the most radically revised version yet. Leema could have just churned out yet another conventional stereo amplifier and kept most fans happy, but that's not the company's way. Instead, it has chosen a forward-looking design that adds an on-board digital-to analogue converter alongside the usual complement of analogue connections. It doesn't ignore the past either, as the inclusion of a decent switchable, MM/MC phono stage shows. Digital fans are well catered for with two optical, one coax and USB inputs. The on-board 24bit/192kHz DAC is a good one, producing fine results with a range of low-compression files from our Apple MacBook. Irrespective of source, whether it's a top class CD player like our reference Naim CDS3/555PS or an uncompressed file from the laptop, the Pulse III is a capable performer. It delivers a powerful, big-boned sound with scale and authority. 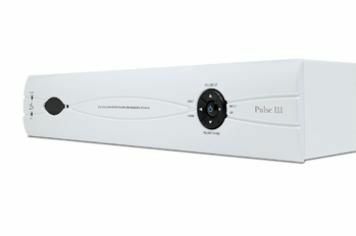 A rated power output of 80-watts per channel isn't particularly special, but the Pulse sounds very much in command of just about any price-compatible speaker you partner it with. We got fine results with Leema's own Xeros, ATC's SCM 11s and ProAc's fine Response D18s. With such speakers there's decent refinement, along with the muscle. This amp has the subtlety to bring Arvo Part's Tabula Rasa to life, and the insight to unravel the music's myriad of instrumental strands. Judged by the highest standards (at this price), there are slight shortfalls in outright transparency and rhythmic precision, but nothing that goes as far as spoiling the final result. We're less taken with the amp's new look and feel. Appearance is a matter of taste, but the cheap feel of the front panel control buttons should be better for the money. That said, the Pulse III is a strong performer.